New research could change the materials handling equipment industry. Researchers from Sandia National Laboratory and Hawaii Hydrogen Carriers (HHC) are seeking to develop a high-performance, low-pressure, zero-emissions hydrogen fuel cells refueling system, to power forklift trucks. A solid-state hydrogen storage system could benefit forklift trucks. It is estimated that a lift truck with this fuel cell system would refuel at low pressure, four to five times quicker than a forklift powered by a battery would take to recharge. This gives hydrogen a considerable advantage over its electric battery competition. Joe Pratt, the project manager from Sandia National Laboratory, said that compared to the hours it takes to recharge forklifts powered by batteries, refueling those that are hydrogen powered is a process that takes under three minutes to complete. Moreover, each fork truck that uses batteries needs three battery packs to ensure they run for a long time and the warehouse needs to reserve space for battery charging. 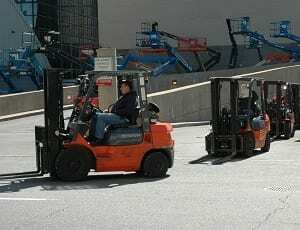 However, forklifts that run on hydrogen fuel cells can continually operate for 8 hours or longer before needing to be refueled “Once you understand how these forklifts operate, the fuel cell advantage is clear,” Pratt said. HHC has high hopes for hydrogen fuel cells in the forklift market. Hawaii Hydrogen Carriers has shown interest in exploring the potential advantages hydrogen fuels have over batteries that are used by the majority of forklifts. They turned to Joe Pratt and Sandia to assist in improving a hydrogen storage system designed for fuel cells. HHC successfully obtained a grant from the U.S. Department of Energy’s Office of Energy Efficiency and Renewable Energy (EERE) for the research. Sandia is no stranger to the fuel cell forklift industry. For many years, Sandia has made an effort toward developing high performance fuel cell systems that are efficient, clean and cost-effective for industrial machines. Technologies are being developed by HHC that are anticipated to result in performance improvements and decreased costs, which should help the fuel cell forklift industry to expand. The low-pressure hydrogen storage system the company is developing provides a solution for facilities that cannot support the high-pressure fueling systems. Thus, this new development could make hydrogen fuel cells more favorable than electric batteries.